Traditional organizational theory advocates increased differentiation and horizontal integration for organizations in unstable environments or with uncertain technologies. This paper seeks to develop a better understanding of the relationship of group structure and the level of interdependency between individuals on group performance under various task complexities. 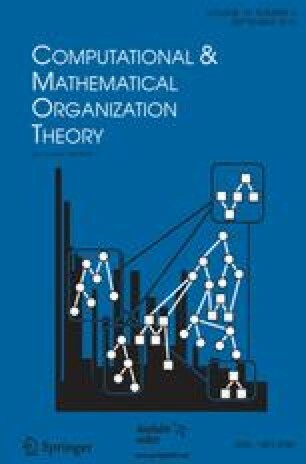 Complexity theory in general, and NK models in particular, are introduced as theoretical frameworks that offer an explanation for group performance. Simulation models are developed, based on the communication network research of Bavelas (1948) and Leavitt (1952), to explore the effects of decentralization and interdependence. The simulation model developed here shows general consistency with previous human subject experiments. However, contrary to predictions, not all decentralized group structures perform well when undertaking complex task assignments. Structures that are highly connected (actors communicating with all others) perform much worse than those with a lower level of connection. Further experiments varying both the number of actors and the degree of interdependence between them find evidence of the “edge of chaos.” This research advances our understanding of organizations beyond earlier models by suggesting that there is an optimal range of interconnectedness between actors or tasks that explains the variation in performance. An intriguing result is that this optimal level of interdependence is fairly low, regardless of the size of the group.